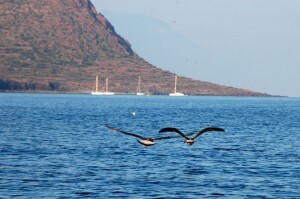 Circumnavigate Filicudi sea is beautiful and is very easy. Even with a small goiter not take you more than an hour. From going to the west and Pecorino, the most beautiful places are the spectacular lava, natural pool hidden inside the Rock of Fortune, the majestic Grotta del Bue Marino, with its shimmering sea, and the huge stack of Canna, Tall 74 meters. For those who love to climb, has recently opened a way. Also living here a particular lizard species that live only here and in ner Strombolicchio at risk of extinction. Continuing, we reach the inlet of the lighthouse, probably one of the best places for snorkelling. 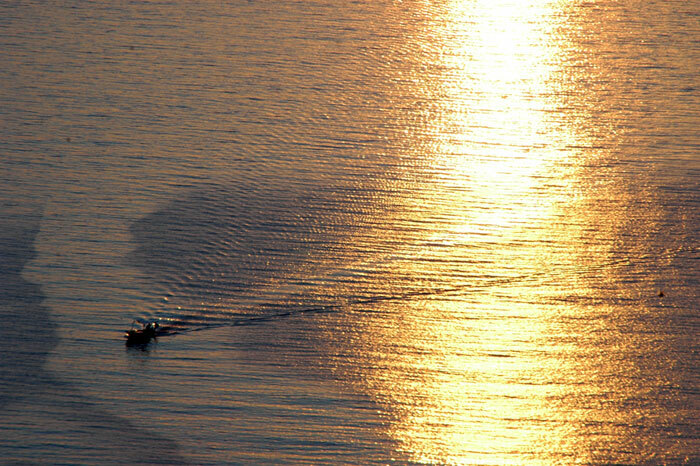 Later there is the great pitfall of Giafante, ideal for fishing. Here the sea and emerald green, pulling straight on the coast will see three large natural formations reminiscent of the pyramids. From this comes the cool part of the island before (the sun sets on the side of the rod). Later you will see the harbor from the sea (the pier you can make fuel) and, once dubbed the promontory of Capo Graziano (attention to dry, did more than sink a ship – including hydrofoil), you’ll be skirting the drills, the fantastic sunset, where you can often see dolphins, and again Pecorini, your starting point. Also for the lovers of canoeing, is a wonderful tour. For those who love diving and underwater escurisioni, places of interest are different. With an experienced guide you can ‘also visit the ancient cemetery of ships off Cape Graziano, or the underwater cave where you play shrimp Nassa, whose walls are made from electric blue color of the eggs of this crustacean. With a raft of medium size can also leave for other Aeolian islands. Salina is Alicudi that are very close and worth a day trip. Alicudi recommend the fish soup fisherman Silvio, while in Salina do not miss a swim in the beautiful bay of Pollara, where Il Postino was filmed. For those that like to stay on the mainland, where the most beautiful places to swim are the drills and grinders, both near the harbor, the first ls behind it, the second on the promontory of Capo Graziano. Access by grinding is on U-bend of the only island road, just after the petrol station. Surely you will see a big sign of prohibited access. Ignore it and continue on the trail. At the fork go straight (otherwise climb on top of the prehistoric village) and soon on your left an old quarry millstones. Some of them bear the initials of the sculptors. The grounds are rich in wildlife and the sea is crystal clear. To reach the point you have to leave 300 meters behind the curve U Straight on the plane of the port, at a large eucalyptus tree, there is the narrow road that leads to the access points. Large flat rocks follow each other in different insenaturene and access to natural turquoise sea. By day, rather than hot, fiery and have no shadow, but by then you’re in paradise becomes a place where the sunset tinged the sea of every shade of red. Finally, the Port and Pecorino can swim and snorkel, or sunbathe on the rocks or black sand that is deposited here and there after a storm. Filicudi is a wonderful place to take long walks through the ancient mule tracks through the island’s long and wide, for over 70 kilometers. The walk easier and at the same time one of the most beautiful, is what leads to the Belvedere. From here you can enjoy a truly unique spectacle: the majesty of the eastern flank of the island, with its impressive lava, and 774 meters of Fossa Ferns, ending steep directly in the sea. From here you can also see the stack of Canna and the island of Alicudi. This place is spectacular in two moments: sunset, when the only fiery sea, and during storms mistral, when the rod is furiously lashed by the waves, almost to disappear into white foam. Even at night is a magical place to see the starry nights FILICUDI. To get here, cross the paved road Stimpagnato and height of a large sandy clearing, take the trail with stone steccionata wood. Another way not to be missed is the excursion to the prehistoric village on the Hillock of Capo Graziano. The trail is short (15 minutes) but definitely ridipo, then you should address it in the cooler hours. 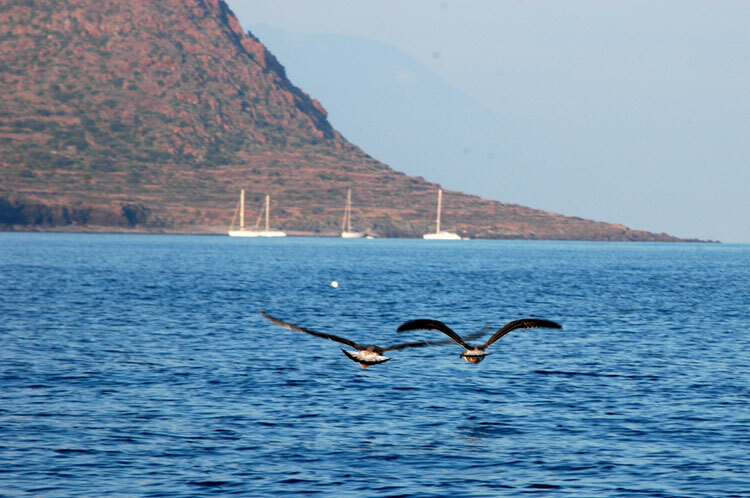 From here you can enjoy a beautiful view, characterized by a new perspective of Filicudi. The prehistoric village consists of thirty circular stone blocks: those who once were the huts of an ancient settlement dating from the Bronze Age (III millennium BC). In spring this plateau on the mountain becomes a rare beauty. Remember scenarios Nordic, with green grass that covers the dark stones of these settlements. For more altletici recommend to continue the trail past the esplanade of the prehistoric village, to reach the top of the mountain, with the sea at 360 degrees, the seven Aeolian Islands and the ancient sacrificial altar, particularly attractive. Access to this walk is along the paved road, shortly after Filicudi Harbour, at the U-bend, 150 yards after the petrol station. Longer, but even more beautiful, is the promenade leading to Zucco Grande, the ancient district semi-abandoned. The trail to Zucco will thrust you into an entirely different than what you leave behind. The trail of red sand has to his left and right the imposing mountain overlooking the crystalline sea. The inhabited part of the island away to your shoulders, while in some places the vegetation is particularly lush, recalling the mountain trails. Skiing covered with ferns, wildflowers, huge caper bushes are the protagonists. Coming here and there you will see the ruins, once inhabited by wealthy people of this place. Zucco was great because one of the most prosperous island, until it is completely abandoned during the Second World War. All the men left and went to the district ‘experience a decline. Nearby you can visit the old source, nearly exhausted, or dinner (reservations by John the Pirate). The trail, which takes directly from any paved road before the hairpin Valley Church, is generally easy, except for a couple of climbs a bit ‘harder. Takes about 25 minutes, better not do it under the midday sun and, if you go at night, expect the full moon, otherwise it’s really dark. One of the more challenging walks is for Blackwater Ferns, the island’s summit (774 m). The trail that winds through ancient terraces is sometimes covered with ferns and thistles. Along the way you realize the grandeur of anthropisation agricultural Filicudi, you’ll notice that practically all sides of the mountains are marked by stone walls now covered with bushes or wormwood plant caper. Once on top the show that promises to be magnificent. The plain red brick is the cap of the third largest of the Aeolian crater (after Stromboli and Salina). From here Filicudi is at your feet you will be above the clouds which sometimes adorn the tops of islands. The mule can ‘be taken from both the Valley of the Pazzi near Hillock, both of Valley Church. The walk takes about three hours and no need special experience, however, must be done with stocks of water, sturdy shoes and long pants. The last part is particolarmemte rough, full of prickly thorns and thistles. Anyone recommend a local guide.